Joshua Becker is known for his pursuit of becoming a minimalist. I love to read his blog entries, full of sound, down to earth advice on how to enjoy more by having less. It's a fact in my life, that clutter and messes make me tired. Carrying things from room to room instead of getting rid of some things, is something I have done forever. True, our family is large. True, we have treasures from a long life (at least treasures to us), and also things from our parents that we don't have the heart to get rid of . . . not yet, anyway. But still, there are many things we don't need. A cardboard box that has not been opened in 10 years - do we really need it? What's in it anyway? I forget. And so many extra this and thats, that fill up closet and cupboard space, just in case we need it. I am a firm believer in being prepared and having a storage of food and important necessities, but this is not what I am talking about. To be quite honest - I have things in my house I don't need! Joshua Becker has come much further down the road to decluttering a life than I have. And I will probably never be as perfect about it as he is. Maybe deep inside I don't want to, or don't feel that a barren house is me. But I want to clean out unwanted and unneeded things in my house and life - a little by little. I know how good I feel every time I tidy up and throw some things out or give away something to charity. After a conversation with my neighbor on Memorial Day 2008, we decided to become minimalist and intentionally live with fewer possessions. We cleared the clutter from our home and lives. As a result, we found a better way to live centered on more important pursuits. It has been a journey of discovering the abundant life is actually found in owning less. And it still ranks as one the best decisions we’ve ever made. But Joshua Becker has taken "becoming minimalist" further. Things and possessions are not what gives us value, something entirely different gives our lives fulfillment and value. Now, this I can truly vouch for and live with. 13. Honesty/Integrity. Children who learn the value and importance ofhonesty at a young age have a far greater opportunity to become honest adults. And honest adults who deal truthfully with others tend to feel better about themselves, enjoy their lives more, and sleep better at night. 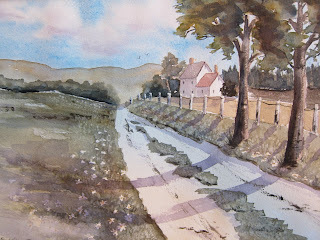 Today's water color is called "On the road home" painted in 2004.